MONDAY, Feb. 11, 2019 (HealthDay News) -- E-cigarettes have obliterated past progress in reducing tobacco product use among teenagers, U.S. health officials said Monday. About 4.9 million middle and high school students were current users of a tobacco product in 2018, up from 3.6 million in 2017, according to results from the annual National Youth Tobacco Survey. All told, more than 1 in 4 high school students and about 1 in 14 middle school students used a tobacco product in 2018, according to U.S. Centers for Disease Control and Prevention data. Researchers chalk this increase up entirely to e-cigarettes, noting that no significant change was found in the use in any other tobacco product -- including traditional tobacco cigarettes. "The skyrocketing growth of young people's e-cigarette use over the past year threatens to erase progress made in reducing youth tobacco use. It's putting a new generation at risk for nicotine addiction," CDC Director Dr. Robert Redfield said in a statement. Kids who use e-cigarettes could be more likely to progress to smoking tobacco after becoming hooked on nicotine, according to previous research cited by the CDC. The nicotine in e-cigarettes also pose other health hazards, said Dr. Anne Schuchat, the CDC's principal deputy director. "Nicotine is highly addictive and can harm brain development, including harmful effects on learning, memory and attention," Schuchat said. Nicotine also primes the brain for addiction to other substances, she added. Matthew Myers, president of the Campaign for Tobacco-Free Kids, called the survey results "deeply troubling." "These results are strong evidence that e-cigarettes are not helping to drive down youth cigarette use," Myers said. "Indeed, if anything, the evidence to date indicates that e-cigarettes could increase the number of kids who smoke cigarettes." There were 1.5 million more young e-cigarette users in 2018 than 2017, and those who vaped did so more often, the CDC found. E-cigarette use increased to nearly 21 percent among high schoolers and 5 percent among middle schoolers in 2018, up from about 12 percent and 3 percent in 2017, respectively. The proportion of high schoolers who vaped at least 20 of the past 30 days increased to 28 percent in 2018 from 20 percent the year before, the CDC added. The agency specifically cited the e-cigarette JUUL in its report, noting that the increase in youth vaping mirrored increased sales of JUUL. The JUUL is shaped like a USB flash drive and is easy to conceal, the CDC noted. It uses liquid nicotine refills called "pods" that contain at least as much nicotine as a pack of cigarettes, and they are available in flavors that appeal to teens. "JUUL entered the U.S. market in 2015 and since Dec. 2017 has held the greatest market share of any e-cigarette in the United States. We know JUUL devices are being used among kids in school, including inside bathrooms and classrooms," said Brian King, deputy director at the CDC's Office on Smoking and Health. "JUUL also has a high nicotine content, among the highest of any e-cigarette on the U.S. market," King continued. "The devices also use nicotine salts, which can allow high amounts of nicotine to be inhaled more easily and with less irritation than the free-based nicotine that's used in most other e-cigarettes." For the fifth year in a row, e-cigarettes were the most commonly used tobacco product among high schoolers. Cigarettes (8 percent) were next most common, followed by cigars (7 percent), smokeless tobacco (6 percent), hookah (4 percent), and pipe tobacco (1 percent). And many kids don't limit themselves to one type of tobacco product, the CDC found. Among current tobacco users, about 2 in 5 (1.7 million) high school students and 1 in 3 (270,000) middle school students used two or more tobacco products in 2018. The most commonly used tobacco product combination was e-cigarettes and tobacco cigarettes among both middle and high school students. The findings were published Feb. 11 in the CDC publication Vital Signs. 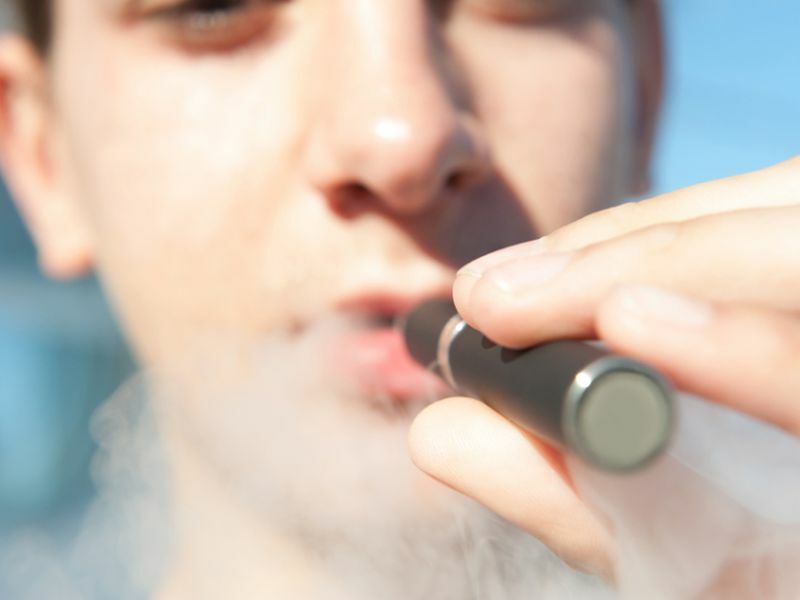 The U.S. Food and Drug Administration is cracking down on e-cigarette marketing and sales aimed at teens, but more needs to be done, said Thomas Ylioja, clinical director of health initiatives at National Jewish Health in Denver. "Vaping products successfully evaded the regulations that reduced youth tobacco initiation over the past 20-plus years, including age restrictions on purchases accompanied by retailer fines, advertising bans, taxes to increase the price, and the restriction on use of products indoors," Ylioja said. "Legislators and policy-makers are responding, but we need rapid action to ban advertising to youth including through social media outlets, restrict purchases including online, raise the age of purchasing nicotine products to 21, ban vaping in places where tobacco is prohibited, and ensure that nicotine vaping products are taxed like other tobacco products," he continued. The U.S. Surgeon General has more about e-cigarettes and young people.